The house on Grettisgata Street, in Reykjavik, is a century old, small and white, situated just a few streets from the North Atlantic. The shifting northerly winds can suddenly bring ice and snow to the city, even in springtime, and when they do a certain kind of silence sets in. This was the case on the morning of March 30th, when a tall Australian man named Julian Paul Assange, with gray eyes and a mop of silver-white hair, arrived to rent the place. Assange was dressed in a gray full-body snowsuit, and he had with him a small entourage. �We are journalists,� he told the owner of the house. Eyjafjallaj�kull had recently begun erupting, and he said, �We�re here to write about the volcano.� After the owner left, Assange quickly closed the drapes, and he made sure that they stayed closed, day and night. The house, as far as he was concerned, would now serve as a war room; people called it the Bunker. Half a dozen computers were set up in a starkly decorated, white-walled living space. Icelandic activists arrived, and they began to work, more or less at Assange�s direction, around the clock. Their focus was Project B�Assange�s code name for a thirty-eight-minute video taken from the cockpit of an Apache military helicopter in Iraq in 2007. The video depicted American soldiers killing at least eighteen people, including two Reuters journalists; it later became the subject of widespread controversy, but at this early stage it was still a closely guarded military secret. Assange is an international trafficker, of sorts. He and his colleagues collect documents and imagery that governments and other institutions regard as confidential and publish them on a Web site called WikiLeaks.org. Since it went online, three and a half years ago, the site has published an extensive catalogue of secret material, ranging from the Standard Operating Procedures at Camp Delta, in Guant�namo Bay, and the �Climategate� e-mails from the University of East Anglia, in England, to the contents of Sarah Palin�s private Yahoo account. The catalogue is especially remarkable because WikiLeaks is not quite an organization; it is better described as a media insurgency. It has no paid staff, no copiers, no desks, no office. Assange does not even have a home. He travels from country to country, staying with supporters, or friends of friends�as he once put it to me, �I�m living in airports these days.� He is the operation�s prime mover, and it is fair to say that WikiLeaks exists wherever he does. At the same time, hundreds of volunteers from around the world help maintain the Web site�s complicated infrastructure; many participate in small ways, and between three and five people dedicate themselves to it full time. Key members are known only by initials�M, for instance�even deep within WikiLeaks, where communications are conducted by encrypted online chat services. The secretiveness stems from the belief that a populist intelligence operation with virtually no resources, designed to publicize information that powerful institutions do not want public, will have serious adversaries. Iceland was a natural place to develop Project B. In the past year, Assange has collaborated with politicians and activists there to draft a free-speech law of unprecedented strength, and a number of these same people had agreed to help him work on the video in total secrecy. The video was a striking artifact�an unmediated representation of the ambiguities and cruelties of modern warfare�and he hoped that its release would touch off a worldwide debate about the conflicts in Iraq and Afghanistan. He was planning to unveil the footage before a group of reporters at the National Press Club, in Washington, on April 5th, the morning after Easter, presumably a slow news day. To accomplish this, he and the other members of the WikiLeaks community would have to analyze the raw video and edit it into a short film, build a stand-alone Web site to display it, launch a media campaign, and prepare documentation for the footage�all in less than a week�s time. Assange also wanted to insure that, once the video was posted online, it would be impossible to remove. He told me that WikiLeaks maintains its content on more than twenty servers around the world and on hundreds of domain names. (Expenses are paid by donations, and a few independent well-wishers also run �mirror sites� in support.) 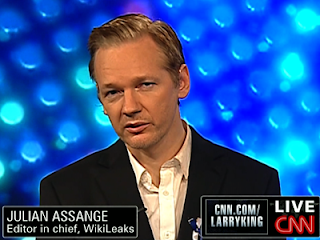 Assange calls the site �an uncensorable system for untraceable mass document leaking and public analysis,� and a government or company that wanted to remove content from WikiLeaks would have to practically dismantle the Internet itself. So far, even though the site has received more than a hundred legal threats, almost no one has filed suit. Lawyers working for the British bank Northern Rock threatened court action after the site published an embarrassing memo, but they were practically reduced to begging. A Kenyan politician also vowed to sue after Assange published a confidential report alleging that President Daniel arap Moi and his allies had siphoned billions of dollars out of the country. The site�s work in Kenya earned it an award from Amnesty International. In his writing online, especially on Twitter, Assange is quick to lash out at perceived enemies. By contrast, on television, where he has been appearing more frequently, he acts with uncanny sang-froid. Under the studio lights, he can seem�with his spectral white hair, pallid skin, cool eyes, and expansive forehead�like a rail-thin being who has rocketed to Earth to deliver humanity some hidden truth. This impression is magnified by his rigid demeanor and his baritone voice, which he deploys slowly, at low volume.